Terminal Island, California: Van Camp Sea Food Co., Inc.. Near Fine. N.D.. Softcover. No date, (c1920?). Approximately 6.25" X 3.25". Accordion type pamphlet with black, red and yellow graphic of red Chicken of the Sea on the cover and a black line illustration of "Uncle Sam." pp. Illustrated. General light wear to corners and edges along with light yellow stain on the back flap. Unusual piece of American and California culinary history. "Just 22 years ago, tuna was a food unknown to American tables!" from the cover. Founded in 1914 when Frank Van Camp and his son bought the California Tuna Canning Company, changing the name to the Van Camp Seafood Company. The phrase "Chicken of the Sea", first devised as a way to describe the taste, was so successful that soon it also became the company name. This early promotional piece features recipes new to the American cuisine and decidedly Californian: Tuna Loaf, Tuna Encore, Tuna Baked in Avocado Shells, Deviled Tuna, Tuna-Avocado Cocktail etc.. Additional photographs upon request. .
By Great Western Sugar Co.
Denver, CO: The Great Western Sugar Co.. Fine. N.D.. Softcover. (Beet Sugar Promotional) c. 1915-early '20's. Tri-fold. pps. 6" X 3". An uncommon piece in FINE condition with minute wear along fold tips and small spot on the back cover. Great Western Sugar Co. was an early producer of beet sugar. The literature promotes beet sugar grown and produced domestically opposed to imported raw sugar materials or produced product. "... as having "exactly the same sweetening power, be of the exact same nutritive value, of equally suitable for making preserves, etc., etc." Subject headings: Sugar is Always Sugar; Manufacturing Processes; No Difference; Jelly Making. ; 8vo . New York: Southern Cotton Oil Trading Co.. Fine. N.D.. Softcover. Single die cut sheet with three folds opening in accordion fashion; front and back 'cover' image of a stero-typical elderly grandmother holding a salad bowl, printed in green and browns. The introduction and recipes are printed on the front and back;  pp. Some tone along the edges and on the back otherwise in Mint condition. Recipes: French Dressing, Quick Mayonnaise, Boiled Salad Dressing, Some Salad Combinations, Grapefruit Salad, Waldorf Salad, Thousand Island Dressing, Hawaiian Salad, Russian Salad Dressing, Tartar Sauce. 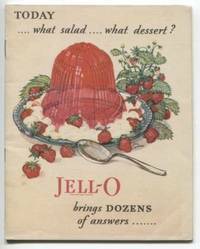 Presumably published sometime during the mid to late 20's as salads in America during the early 20th century, were regulated to remain inside gelatin. Southern Cotton Oil Trading Co., became Southern Cotton Oil Company of Louisiana in May of 1925. About 3 months latter the name was changed to Wesson Oil and Snowdrift Co., Inc. ; 8vo . Le Roy NY: The Jell-O Company. Very Good. 1928. Softcover. Advertising booklet; stapled; original wraps in color. 23 pages. 6" X 4.5" . The corners are sharp and images bright. There is some interior edge wear and short closed tears. Some exterior tone and very small stains on the cover. Overall a very nice copy. ; 8vo . The Hills Brothers Company. Very Good. 1925. Softcover. Stapled wraps. 22 pages. Color and black and white illustrations. Very good only due to the damage to the lower right corner which extends into the booklet 2 leaves, with decreasing severity. LAID IN is the, original and uncommon, form letter sent along with this booklet by Hills Brothers on behalf of the local grocer, in this case Alta Market of Denver Colorado. It's purpose was to introduce a new food, Dromedary Dates to the American people. The letter has incomplete crease to the lower corner corresponding to the booklet corner damage. "The Hills Brothers Company, fruit importers, altered the date market with their massive marketing campaign. Prior to their advertisements many Americans viewed dates as a sticky, bug infested mess. Hill Brothers unveiled advertisements that suggested the romance of the Middle East could be eaten in a date. This recipe book... was sent to customers to educate them on how to use dates in their everyday meals, while also invoking the mystery of the so called Orient." (Sarah Seekatz; "Dates the sticky history of the sweet fruit" by Michele Kayal. National Geographic, 6/2015.) ; 8vo . The Best Foods, Inc.. Fine. N.D.. Softcover. FINE. 6"X 3.25" Original, stapled wraps. Advertising booklet for use of Gold Medal Mayonnaise. No date, c1920 - 1930's. Note there is very light wear on the spine and a small lightened area on the front cover. Wonderful illustrations throughout along with recipes such as "Lorenzo Salad" of New York's famous chefs salad of Hotel McAlpin; Church Supper Salad extolling the homemaker "Why not be the one noted for her wonderful salads?" ; and "Prize Salads from California - the land of Sunshine, Turquoise Skies, and the finest fruits and vegetables in the world." ; 8vo . Canton, OH: The Hygienic Products Co.. Fine. Hardcover. c 1940's Full color. FINE. 11" X 6.5" four fold pamphlet. Advertisment side one is for the product Sani-Flush for use in toliets and radiators. 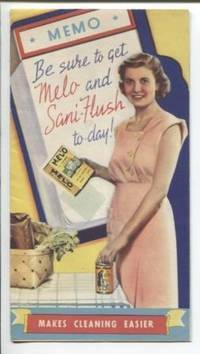 Advertisment side 2 is for Mel'O "The modern water softener and everyday household cleaner". Both sides are FINE. Exceptional piece. .
Chicago: Armour and Company. Very Good. N.D.. Softcover. N.D. c 1920. Original brown paper wrap with staple binding. 5" X 3.25" 16 pp. The booklet represents "Simon Pure" Armour Leaf Lard and includes recipes with color illustrations. Simon Pure is represented as a superior quality lard requiring a 3/4 less quantity of use than ordinary lard. Sold in pails of five sizes only. 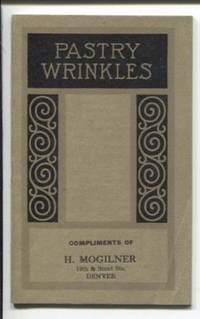 Printed on the cover is Compliments of H. Mogilner, 12th & Stout Sts. Denver. Lower corner has been bent with corresponding pages also bent. Remains attractive in very good condition. . Very Good. N.D.. Hardcover. 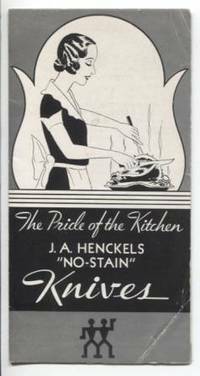 c1920's Henckels Twin Knife product insert catalog. Single sheet, double sided five fold brochure 6" X 2" Distributed by "The Buerger Bros. Supply Co. 1732-40 Champa Street, Denver, Colo. An attractive bright silver and black cover and silver boarder. Deep crease on lower corner and much smaller one on the top corner; some edge wear. Listing of 35 knives and utensils plus two Kitchen Boards; includes Stock number, an individual image and a physical and usage description/instruction blurb. .
La Grange, Illinois: Chicago Dietetic Supply Inc.. Fine. N.D.. Softcover. c1950-1960. About fine with a single corner crease and single edge wrinkle. No library holdings. Not found in the trade. Single sheet, double sided fold down recipe brochure for recipes using rye flour. 5" x 4" Many with limited use of milk or eggs. Cellu supplied Dietetic Products: Foods, Scales, Insulin, Equipment as well as offering flours and meals employed for making dietetic foods, it is also no longer in operation. .
Sutton Publishing. Near Fine in Fine dust jacket. 1998. Hardcover. 0750915668 . Hardback NF/F Red stamped gilt border and title on spine. Clear protective cover. Previous owner's written in ink on the top of the book signatures. " 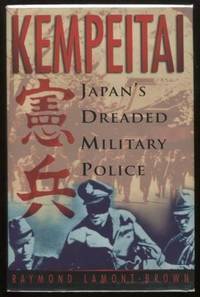 The Kempeitai, Japan's secret military police and counter-espionage service, were one of the most dreaded organizations of the Second World War. Through sheer horror tactics they degraded their victims to demonstrate their superiority over reluctant nations and break the human spirit. First-hand accounts in this book bring the atrocities to life. " ; 9.4 X 6.1 X 0.8 inches; 192 pp pages . Harper. Near Fine in Fine dust jacket. 2004. First Edition; First Printing. Hardcover. 0066211719 . Hardback NF/F Blue stamped gilt border and title on spine. Remainder. " 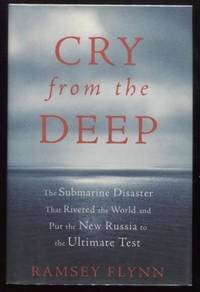 On August 12, 2000, during one of the most important military demonstrations in post-Soviet history, an enormous explosion sank Russia's most prized nuclear submarine, the Kursk. When Vladmir Putin's men failed to rescue the 118 young submariners trapped under the icy Barents Sea and refused timely help from "foreigners" for four days, the Russian president assured his angry nation that all the men had died within minutes of the blasts. An earlier rescue would not have changed anything. " ; Remainder; 9.1 X 6.1 X 1.2 inches; 304 pp pages . Putnam Adult. Near Fine in Fine dust jacket. 2002. First Edition; First Printing. Hardcover. 039914871X . Hardback NF/F Black stamped gilt border and title on spine First Edition. 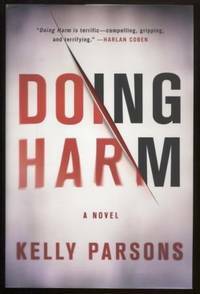 A first printing. Clear protective cover. Previous owner's written in ink on the top of the book signatures. " 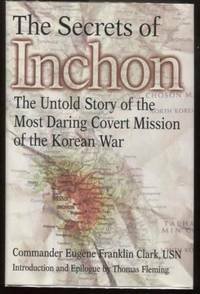 An account based on the experiences of a naval lieutenant who witnessed a covert Korean War mission firsthand discusses his two-week assignment to obtain vital intelligence in the wake of firefights, night raids, hand-to-hand combat, and a small naval battle. " ; 9.3 X 6.1 X 1.1 inches; 352 pp pages . New York: Franklin Watts. Very Good in Poor dust jacket. 1969. First American. Hardcover. Pictorial hard cover with some light shelf wear, else a clean copy. [32p]. Illustrated by Charles Mozley. The dust jacket is in poor condition with numerous tears, creases etc. It is, however not price clipped and, post picture, a protective, removable cover applied. This is the first book Mahy had published to the international market (flap blurb). "Margaret Mahy was a New Zealand author of children's and young adult books. Many of her story plots have strong supernatural elements but her writing concentrates on the themes of human relationships and growing up. She wrote more than 100 picture books, 40 novels and 20 collections of short stories. At her death she was one of thirty writers to win the biennial, international Hans Christian Andersen Medal for her "lasting contribution to children's literature" Wikipedia. ; 8vo . New York: Harper & Brothers. Very Good-. 1901. First Thus. Hardcover. Original cream colored parchment paper over board with gilt lettering and decoration. xvii, 192 p. Portrait frontispiece of Carroll and 41 black and white plates by Peter Newell. Beautiful boarder page decorations in gray/green by Robert Mary Wright. Text block edge rough cut. Tone on the cover and along the page edges. One plate loose - laid in. Peter Newell was a distinguished artist whose illustrations are known for infectious humor. Introduction by Edward S. Martin. 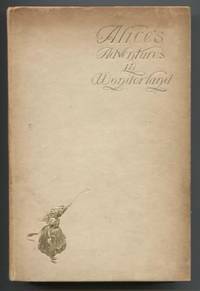 The book also contains the poems "An Easter Greeting," and "Christmas Greetings" [From A Fairy To A Child.] and "To Every Child Who Loves 'Alice.' An unusual edition. ; 8vo . East Aurora, New York: Roycrofters. Very Good. 1900. Full-Leather. Association copy. Gift inscription on the first blank-heavily toned- page "With much love/ to Margaret/ Bertha C. Hubbard/ September 24, 1900." Red limp suede, with leather title plate and gilt lettering; yap edges and red silk pastedown. Frontispiece portrait of Ruskin. The Title page and decorative initials designed by Samuel Warner. First letter monogram with boarder; all text in black with with red letter marginal titles and beautiful Roycroft colophon. Ends rubbed. This copy is not signed or numbered. Bertha C. Hubbard was the co-founder of the Roycrofters. A talented and beautiful woman she and Elbert Hubbard divorced soon after this book was published. ; 8vo . Broadway. Near Fine in Near Fine dust jacket. 2001. Hardcover. 0767904133 . First printing. Some soil on the text block edge and minor edge wear. In clear removable protective cover. 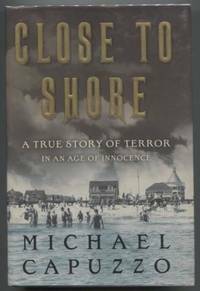 When ocean swimming was just becoming popular and luxurious Jersey Shore resorts were thriving as a chic playland for an opulent yet still innocent era's new leisure class, Americans were abruptly introduced to the terror of sharks, the first in U.S. history. Michael Capuzzo is an award winning journalist. ; 9.3 X 6.5 X 1.2 inches; 336 pages . Los Angeles: Grafton Publishing Co.. Very Good. 1911. Hardcover. 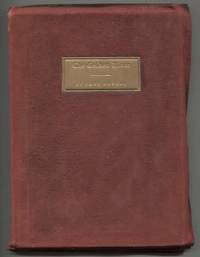 1926 "Eleventh Edition" (printing). 393 pp. Index. Illustrated with 11 black and white protographs: frontispiece of Mission San Carlos De Carmel; other iconic images and an early map of California. Rough cut edges. Corners bumped and edges mildly worn. An attractive copy. 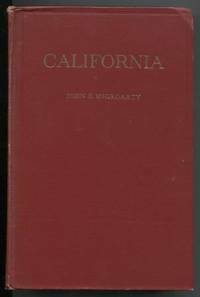 McGroarty was a California poet laureate, Los Angeles Times columnist and author who also served two terms as a Democratic Congressman from California. ; 8vo . St. Martin's Press. As New in As New dust jacket. 2014. First Edition; First Printing. Hardcover. Signed by Author; 1250033470 . Signed by Author Hardback As New/As New Gray stamped gilt border and title on spine " Chief resident Steve Mitchell is the quintessential surgeon: ambitious, intelligent, confident. Charged with molding a group of medical trainees into doctors, and in line for a coveted job, Steve's future is bright. But then a patient mysteriously dies, and it quickly becomes clear that a killer is on the loose in his hospital. A killer set on playing a deadly game with Steve. A killer holding information that could ruin his career and marriage. Now, alone and under a cloud of suspicion, Steve must discover a way to outsmart his opponent and save the killer's next victim before the cycle repeats itself again." ; 9.3 X 6.2 X 1.4 inches; 368 pp pages . Arrow Publications, Inc.. New. 2013. Softcover. 1886296367 . New. 171pages. "With insights that come fro over forty years in ministry Francis Frangipane is a spiritual father to many in the body of Christ. 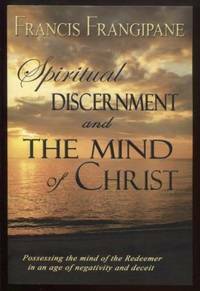 ... Francis presents principles of godly discernment..." Topics include: The mind of Christ; spiritual warfare; the radical Muslim; hearing Christ's voice; true and false teachers; protocols for prophetic ministries; righteous judgment. ; 9.7 X 6.0 X 0.3 inches; 176 pages .